Inspired by the stories of hundreds of Roman and Greek ships sunken by the merciless Mediterranean storms, this original piece is a testaments to the beauty that lays on the bottom of this ancient sea. Safe in the depths of the water are timeless fragments of the Greek and Roman world embedded in the beauty and fervor of marine life. 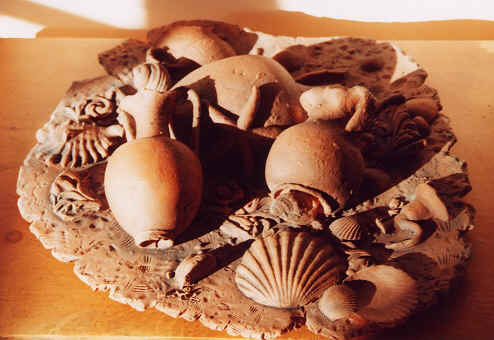 Hand-sculpted in fine terra-cotta. Each piece will be unique. Original design. 24" in diameter. 3The continuation of the Mediterranean theme, these amphoras are artistic reproductions of those discovered in archeological sites all over Italy. Sculpted with attention to smallest details in fine terra-cotta and individually hand-painted in acrylics, they will add a unique touch to any kitchen or living room credenza. 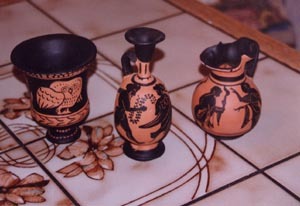 Amphoras average 8" in height.